General James Barry Munnik Hertzog KC, better known as Barry Hertzog or J. 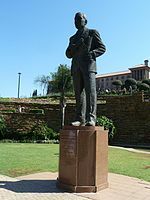 B. M. Hertzog (6 April 1866 – 21 November 1942), was a South African politician and soldier. He was a Boer general during the second Anglo-Boer War who became Prime Minister of the Union of South Africa from 1924 to 1939. Throughout his life he encouraged the development of Afrikaner culture, determined to protect the Afrikaners from Britain's influences. He is the only South African Prime Minister to have served under three British Monarchs (George V, Edward VIII, and George VI). Hertzog first studied law at Victoria College in Stellenbosch, Cape Colony. In 1889 he went to the Netherlands to read law at the University of Amsterdam, where he prepared a dissertation on the strength of which he received his doctorate in law on 12 November 1892. Hertzog had a law practice in Pretoria from 1892 until 1895, when he was appointed to the Orange Free State High Court. During the Boer War of 1899–1902 he rose to the rank of general, becoming the assistant chief commandant of the military forces of the Orange Free State. Despite some military reverses, he gained renown as a daring and resourceful leader of the guerilla forces continuing to fight the British. Eventually, convinced of the futility of further bloodshed, he signed the May 1902 Treaty of Vereeniging. With South Africa now at peace, Hertzog entered politics as the chief organiser of the Orangia Unie Party. 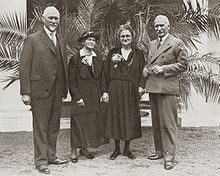 In 1907, the Orange River Colony gained self-government and Hertzog joined the cabinet as Attorney-General and Director of Education. His insistence that Dutch as well as English be taught in the schools met bitter opposition. He was appointed national Minister of Justice in the newly formed Union of South Africa. He continued in office until 1912. His antagonism to imperialism and Premier Botha led to a ministerial crisis. In 1913 he led a secession of the Old Boer and anti-imperialist section from the South African Party. At the outbreak of the South African rebellion in 1914, Hertzog remained neutral. In the years following the war, he headed the opposition to the government of General Smuts. In the general election of 1924, his National Party defeated the South African Party of Jan Smuts and formed a coalition government with the South African Labour Party, which became known as the Pact Government. In 1934, the National Party and the South African Party merged to form the United Party, with Hertzog as Prime Minister and leader of the new party. A Department of Labour was established while the Wages Act (1925) laid down minimum wages for unskilled workers, although it excluded farm labourers, domestic servants, and public servants. It also established a Wage Board that regulated pay for certain kinds of work, regardless of racial background (although whites were the main beneficiaries of this legislation). The Old Age Pensions Act (1927) provided retirement benefits for white workers. Coloureds also received the pension, but the maximum for Coloureds was only 70% that of whites. The establishment of the South African Iron and Steel Industrial Corp in 1930 helped to stimulate economic progress, while the withdrawal of duties on imported raw materials for industrial use encouraged industrial development and created further employment opportunities, but at the cost of a higher cost of living. Various forms of assistance to agriculture were also introduced. Dairy farmers, for instance, were aided by a levy imposed on all butter sales, while an increase in import taxes protected farmers from international competition. Farmers also benefited from preferential railway tariffs and from the widening availability of loans from the Land Bank. The government also assisted farmers by guaranteeing prices for farm produce, while work colonies were established for those in need of social salvage. Secondary industries were established to improve employment opportunities, which did much to reduce white poverty and enabled many whites to join the ranks of both semi-skilled and skilled labour. An extension of worker's compensation was carried out, while improvements were made in the standards specified under a contemporary Factory Act, thus bringing the Act into line with international standards with regard to the length of the working week and the employment of child labour. A law on miners' phthisis (pulmonary tuberculosis) was overhauled, and increased protection of white urban tenants against eviction was introduced at a time when houses were in short supply. The civil service was opened up to Afrikaners through the promotion of bilingualism, while a widening of the suffrage was carried out, with the enfranchisement of white women. The pact also instituted ‘penny postage’, automatic telephone exchanges, a cash-on-delivery postal service, and an experimental airmail service which was later made permanent. The Department of Social Welfare was established in 1937 as a separate governmental department to deal with social conditions. Increased expenditure was also made on education for both whites and coloureds. Spending on coloured education rose by 60%, which led to the number of coloured children in school grow by 30%. Grants for the blind and the disabled were introduced in 1936 and 1937, respectively, while unemployment benefits were introduced in 1937. That same year, the coverage of maintenance grants was extended. Although the social and economic policies pursued by Hertzog and his ministers did much to improve social and economic conditions for whites, they did not benefit the majority of South Africans, who found themselves the targets of discriminatory labour laws that entrenched white supremacy in South Africa. A Civilised Labour Policy was pursued by the Pact Government to replace black workers with whites (typically impoverished Afrikaners), and was enforced through three key pieces of legislation: the Industrial Conciliation Act No 11 of 1924, the Minimum Wages Act No. 27 of 1925, and the Mines and Works Amendment Act no. 25 of 1926. The Industrial Conciliation Act No 11 of 1924 created job reservation for whites while excluding blacks from membership of registered trade unions (which therefore prohibited the registration of black trade unions). The Minimum Wages Act No. 27 of 1925 bestowed upon the Minister for Labour the power to force employers to give preference to whites when hiring workers, while the Mines and Works Amendment Act No. 25 of 1926 reinforced a color bar in the mining industry, while excluding Indian miners from skilled jobs. In a sense, therefore, the discriminatory social and economic policies pursued by the Pact Government helped pave the way for the eventual establishment of the Apartheid state. Constitutionally, Hertzog was a republican who believed strongly in promoting the independence of the Union of South Africa from the British Empire. His government approved the Statute of Westminster in 1931, and replaced Dutch as the second official language with Afrikaans in 1925, as well as instating a new national flag in 1928. His government approved women's suffrage for white women in 1930, thus hardening the dominance of the white minority. Property and education requirements for Whites were abandoned in the same year, with those for non-Whites being severely tightened, and in 1936 Blacks were completely taken off the common voters' roll. Separately elected Native Representatives were instead instated, a policy repeated in the attempts of the later apartheid regime to disenfranchise all non-Whites during the 1950s. Through this system of gradual disenfranchisement spanning half a century, the South African electorate was not made up entirely of Whites until the 1970 general election. Alongside this, Hertzog saw France as the main threat to peace in Europe, viewing the Treaty of Versailles as an unjust and vindictive peace treaty, and argued the French were the principal trouble-makers in Europe by seeking to uphold the Versailles treaty. :303-304 Hertzog argued that if Adolf Hitler had a belligerent foreign policy, it was only because of the Treaty of Versailles was intolerably harsh towards Germany and if the international system was revised to take account of Germany's "legitimate" complaints against Versailles, then Hitler would become a moderate and reasonable statesman. :301 When Germany remilitarized the Rhineland in March 1936, Hertzog informed the British government that there was no possibility of South Africa taking part if Britain decided to go to war over the issue, and in the ensuing crisis, South African diplomats took a very pro-German position, arguing that Germany was indeed right to violate the Treaty of Versailles by remilitarizing the Rhineland. On 4 September 1939, the United Party caucus revolted against Hertzog's stance of neutrality in World War II causing Hertzog's government to lose a vote on the issue in parliament by a vote of 80 to 67. Governor-General Sir Patrick Duncan refused Hertog's request to dissolve parliament and call a general election on the question. Hertzog resigned and his coalition partner Smuts become prime minister and led the country into war, and political re-alignments followed with Hertzog and his faction joining with Daniel Malan's opposition Purified National Party to form the Herenigde Nasionale Party with Herzog becoming the new Leader of the Opposition. However, Hertzog soon lost the support of Malan and his supporters when they rejected Hertzog's platform of equal rights between British South Africans and Afrikaners, prompting Hertzog to resign and retire from politics. Hertzog died on November 21, 1942, at the age of 76. A 4-metre statue of Hertzog was erected in 1977 at the front lawns of the Union Building. The statue was taken down on 22 November 2013. It was still in good condition, save that the spectacles which originally were included on the statue had been removed. The statue was removed to make way for a 9-metre high statue of Nelson Mandela. The supporters of Hertzog invented the Hertzoggie, a jam-filled tartlet with a coconut meringue topping that is still a popular confection in South Africa. ^ "James Barry Munnik Hertzog - South African History Online". Retrieved 30 April 2015. ^ Hertzog, J.B.M. (1892). De 'income'-bond, zijn rechtskarakter en de waarde zijner economische en juridische beginselen (Doctoral thesis). Amsterdam: Universiteit van Amsterdam. ^ Album academicum van het Athenaeum Illustre en van de Universiteit van Amsterdam. Amsterdam: R.W.P. de Vries. 1913. p. 173. ^ Butler, Anthony (2017). Contemporary South Africa. Macmillan Education. ISBN 978-1-137-37338-0. ^ a b c d e f g h "The Pact Government administration". Archived from the original on 23 March 2005. Retrieved 23 October 2011. ^ a b c Giliomee, Hermann (2003). The Afrikaners: Biography of a People. C. Hurst & Co. ISBN 978-1-85065-714-9. ^ Seekings, Jeremy (April 2006). ""Not a Single White person should be allowed to go under": Swartgevaar and the Origins of South Africa's Welfare State, 1924-1929" (PDF). University of Cape Town. Archived from the original (PDF) on 26 April 2012. Retrieved 8 December 2011. ^ a b c Davenport, T. R. H. (June 1991). South Africa: a modern history. University of Toronto Press. ISBN 978-0-8020-5940-6. ^ Feinstein, C. H. (2005). An Economic History of South Africa: Conquest, Discrimination, and Development. Cambridge University Press. ISBN 978-0-521-85091-9. ^ "F.H.P. Creswell - Ancestry24". Archived from the original on 13 July 2012. ^ Haroon Bhorat (2001). Fighting Poverty: Labour Markets and Inequality in South Africa. Juta and Company. ISBN 978-1-919713-62-5. ^ "South Africa" (PDF). ssa.gov. 2011. Retrieved 2018-07-22. ^ Haarman, C (2000). Social assistance in South Africa : it's potential impact on poverty (PDF) (Ph.D.). University of the Western Cape. hdl:20.500.11892/101694. ^ Alistair Boddy-Evans. "South Africa's Pact Government of 1924 to 1933". About.com Education. Retrieved 30 April 2015. ^ Alistair Boddy-Evans. "Pre-Apartheid Era Laws: Industrial Conciliation Act No 11 of 1924". About.com Education. Retrieved 30 April 2015. ^ Alistair Boddy-Evans. "Pre-Apartheid Era Laws: Minimum Wages Act No. 27 of 1925". About.com Education. Retrieved 30 April 2015. ^ Alistair Boddy-Evans. "Pre-Apartheid Era Laws: Mines and Works Amendment Act No. 25 of 1926". About.com Education. Retrieved 30 April 2015. ^ a b c d e f g h i j k l m n o p q r s t u v w x y z aa ab ac ad Fry, Michael Graham (1999). "Agents and structures: The dominions and the Czechoslovak crisis, September 1938". In Lukes, Igor; Goldstein, Erik. The Munich Crisis, 1938: Prelude to World War II. London: Frank Cass. doi:10.1080/09592299908406134. ISBN 978-0-7146-4995-5. ^ Weinberg, Gerhard (1970). The Foreign Policy of Hitler's Germany Diplomatic Revolution in Europe. Chicago: University of Chicago Press. p. 258. ^ "J.B.M. Hertzog - prime minister of South Africa". ^ "Hertzoggies – The Political Food Show". 2016-02-26. Retrieved 2016-07-22. ^ Baderoon, Gabeba (2014). Regarding Muslims: From Slavery to Post-Apartheid. Johannesburg: Wits University Press. p. 93. ISBN 9781868147694.